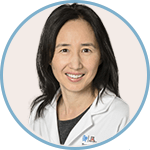 Dr. Wei Zhou, MD, FACS, is a professor of surgery and chief of vascular surgery at the University of Arizona. For the last 10 years, she was chief of vascular surgery at VA Palo Alto Healthcare System. Dr. Zhou shares her experience from her tenure, and encourages fellows to keep an open mind about the VA.
What would you tell trainees who haven’t thought about practicing at a VA hospital? I think the VA is a great place for new graduates and for people who are interested in doing research. The VA is a place where you can really benefit patients and see more complex anatomy. It’s not just treating TASC A and TASC B lesions. You see really sick patients with advanced diseases. If you look at it from procedure standpoint, there are a lot of older men with family history of aortic disease. Advanced occlusive disease is common among veterans. We perform a good amount of carotid stents, carotid endarterectomies, and lower extremity interventions. The VA is a good place to hone your skills and get yourself very comfortable with any complex situation. For people interested in doing research, the VA is also a great place. I personally have benefited from the VA research programs. The VA has the longest history of electronic medical records, and veterans typically have longitudinal follow up. Many veterans are interested in signing up for the trials to receive the best and newest therapy. What would you recommend fellows do to prepare for practicing in a VA setting? I think you have to be the right person and right personality to be at the VA. You have to have a good attitude towards your patients. I always treated patients with respect, because those patients served our country and deserve to be served. Veterans are generally very trusting of authority, so you really have to look into every aspect of their medical and social histories to take the best care of them. I think that’s important. Are there pathologies you see in your practice that are more prevalent in the veteran population? You see much more advanced disease. Diabetes, hypertension, and coronary artery disease are very common. Many veterans are very stoic, and they don’t really come in to see the doctor until it’s bad. For example, many people come in with critical limb ischemia, and advanced foot wounds; they come in with severe carotid stenosis. Or suddenly, they have these big aneurysms that have not been followed. Get stories like these sent to your email. Sign up for our quarterly email newsletter to receive physician stories, product news, training opportunities and more in your inbox. Wei Zhou is an independent physician with no financial ties to Cook Medical.